Adhesives for Commercial Vehicles ⋆ GME - First German Mechatronic L.L.C. The globally growing transport logistics industry focuses on lightweight and thus low-consumption, long-lived commercial vehicles. 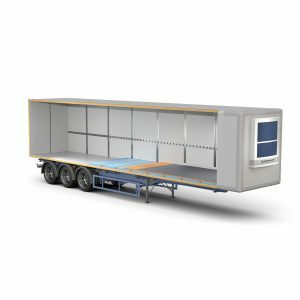 As the market leader in the area of refrigerated vehicles, KÖMMERLING has convinced customers for more than 25 years with innovative adhesive and sealant technology that makes a sustainable contribution to weight reduction, air tightness and sound-damping. We understand your requirements and optimise your processes – you can trust our competence! In order to achieve the lowest possible vehicle weight without decreasing stability, side walls, roofs or floors are produced using sandwich manufacturing. In this process, such diverse materials as wood, metal, plastic or ultramodern composite materials are combined with a foam core. Conventional joining methods such as riveting or screwing result in damage to the thermal insulation or to the components through deformation or corrosion. This is prevented if adhesives and sealants are used. They actually increase rigidity, reduce the panel weight and help to improve insulation. Following the sandwich manufacturing step, side walls, roof and floor are assembled into a stable box. This is followed by the interior finishing, such as the mounting of loading rails, scuff rails, collision protection plates or door seals. Finally, the interior and exterior joints of the vehicle are sealed against water intrusion. Adhesives and sealants from KÖMMERLING master these tasks optimally. They bond the different materials securely, are resistant to temperature and weather, balance different elongations and provide a durable seal against moisture. Due to our broad range of different pot lives, they are suitable for both manual and automated processing. They must comply with the highest hygienic standards. Frequent loading and unloading with lift trucks or forklifts require high resilience and slip resistance. Easy cleaning and resistance to low temperatures must be ensured. For this application, KÖMMERLING offers a component system on the basis of polyurethane and epoxy. Depending on the respective requirement on the floor coating, the products can be combined in a flexible manner.